It’s no secret: the world HAS shifted to one of online presence and social media where user convenience is key. We have known for a while that salons who offer online bookings make more money than those who don’t. However, in an attempt to better understand salon online bookings behavior, we ran a survey on YOUR customers (those who usually don’t book online) asking why they didn’t. The results were not at all what we expected. A tremendous opportunity for business growth lies in salon online bookings. An extension of your excellent customer care and service, online bookings give your clients a solution to their relentless schedules. As we mentioned in one of our previous articles, it’s time to capitalise on the flexibility your customers are now requiring. One way to do this is through your website, Facebook page or salon app – working hand in hand with each other, they’re all-in-one solutions in which clients should always be offered an online booking option. To learn more about how Online Bookings can help your business, head over here. 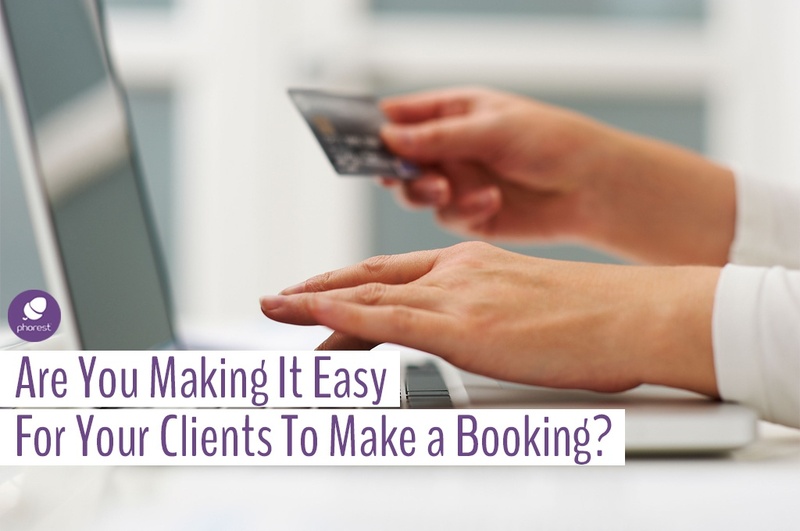 Running a survey with salon clients (also known as an end-user survey) was to greater understand the reasons behind why some of your clients didn’t book online. The results were for the most surprising: 27.3% don’t book appointments online simply because they are not aware you offer this service. Imagine if only half of this 27.3% were potential new customers looking for an online booking solution at 10 pm when your salon is closed or on a busy day at work, when they can’t leave their desks are surrounded by colleagues and are too shy to pick up the phone and ask for a waxing. Let’s do some quick math: say the 27.3% metric represents a total of 100 clients (new and returning). Imagine half of these are potential new customers. If 50 new clients a year booked on average a 30€ service or treatment every 2 months, that makes you an effortless revenue increase of 9000€ in online bookings for your salon. Just because they were able to find a way to book online with you that first time. The second most important thing that came out of this survey is that most clients rebook while they’re in your salon (43.3%). In short, the majority of the sampled clients say they don’t use salon online bookings as they rebook in person which is great, but the next highest percentage is because they didn’t know the salon offered it. What the results have shown is that a significant portion of your customers who don’t use salon online bookings simply isn’t aware of all their options. Just because you have online bookings on your salon website or Facebook page, it does not mean people have heard about it. Worry not! If you’re now wondering how to promote your salon online bookings, you might be inspired by our Top 9 Favourite Ways To Effortlessly Market Your Online Bookings. Need more help to get bookings through your website? Get in touch with danielle.mallen@phorest.com! For those of you who already use Phorest Salon Software, we will be uploading an email template you can use to promote your Online Bookings to your clients, and it will be made available through your Marketing section as of tomorrow. Are you not a Phorest client? Request a free demo today and see all the other ways we can help you get clients in more often, spending more!